President Donald Trump on Tuesday released a lengthy defence of Saudi Arabia over the killing of the Saudi journalist Jamal Khashoggi. Trump signalled he does not intend to call for significant changes to the US-Saudi relationship. The president also would not state whether Crown Prince Mohammed bin Salman, the de factor ruler of the kingdom, was responsible for Khashoggi’s death. 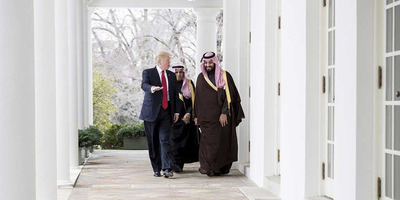 In doing so, Trump signalled he does not intend to demand significant changes to the US-Saudi relationship despite bipartisan calls in Congress for America to reevaluate the partnership in the wake of the brutal killing. In his statement, Trump said his decision was not based on Saudi representatives describing Khashoggi as an “enemy of the state” or a member of the Muslim Brotherhood, repeating smears about the slain journalist that have even been dismissed by the Saudi government. The president also would not state whether Crown Prince Mohammed bin Salman, the de factor ruler of the kingdom, was responsible for Khashoggi’s death. Crown Prince Mohammed is widely suspected of orchestrating the killing. This all comes less than a week after a bombshell report from The Washington Post indicated the CIA had concluded with “high confidence” that Crown Prince Mohammed directly ordered Khashoggi’s killing. The CIA was expected to deliver a report to Trump on Khashoggi’s killing later Tuesday. Critics feel Trump has once again undermined the US intelligence community, a judgment previously made over his response to Russian interference in the 2016 presidential election. Trump’s statement embellishes the economic benefits of the US-Saudi partnership, particularly in terms of arms sales. The president claimed the kingdom had agreed to invest $US450 billion in the US, including $US110 billion in military equipment. Trump has cited similar numbers in the past, numbers that fact-checkers have repeatedly said are blatantly false. Beyond the purported economic gains from retaining a strong relationship with Saudi Arabia, the president also touted America’s strategic partnership with the kingdom. In doing so, he downplayed Saudi Arabia’s human-rights violations, particularly in Yemen, as well as the various ways in which it’s exported terrorism across the world in recent years. The Trump administration has targeted Saudis it has linked to Khashoggi’s killing with sanctions, but Murphy and others in Congress are pushing for the US to be far more forceful in its reaction to the kingdom. Khashoggi, a US resident who wrote for The Washington Post, was killed in the Saudi Consulate in Istanbul on October 2. After nearly three weeks of denials after Khashoggi’s initial disappearance, the Saudis finally acknowledged the journalist had been killed. The kingdom’s narrative on Khashoggi’s killing has shifted multiple times since early October, but it has maintained that Crown Prince Mohammed had no knowledge of the operation that led to his death.